I usually stop by the cookie bin when I'm checking out of Whole Foods. They always have the best cookies and you can buy just one. Today's special was this everything cookie and it was amazing. It was chock full of white and dark chocolate chips, coconut flakes, pecans, rolled oats and cranberries. I naturally did what most people do after tasting a cookie like this, I went home and made my own. Three hours later, I'm pulling the first batch out of the oven and that's after letting the dough sit in the fridge for two hours. This recipe is adapted from "The Sprouted Kitchen", website who adapted the recipe from "Small Plates and Sweet Treats" by Aran Goyoaga. I changed out the flours, and used walnuts and dried soft and juicy mandarin slices from Trader Joe's in place of pecans and coconut flakes. In a stand mixer, combine the butter and sugars and beat for 3 minutes. Add vanilla and egg, mix and scrape sides. Add in the flours, baking powder, baking soda, salt, cinnamon and nutmeg. Mix until dough comes together, do not over mix. Add chocolate, nuts and orange slivers, mix until combined. Pour out onto parchment paper and roll into a tight log. Refrigerate 1 to 2 hours. Cut log into 1/2 inch rounds and place on a cookie sheet with silpat or parchment paper. Bake 8 to 10 minutes. The cookies should be slightly under baked. Cool on wire rack. Enjoy! Makes 18 to 24 cookies, depending on the size. MMMmm..I love the idea of mandarins in a cookie. I'm not one for cookies much but a good homemade one is impossble to turn down. Looks delicious, Cheri! Thanks Robyn, I'm on my second bag of the mandarins they are delicious. Thanks Lynn, they are pretty good! I need a cup of coffee and a handful of these please! Hi Ela, they are almost gone, can't make cookies too often around here, thats for sure. Everything? Does this mean I can live on these? If so, I'd die a happy woman. Hi Maureen, ha! your funny. I love the aroma of cookies baking in the oven and these look delicious. Thanks Tina, I do too, the aroma is part of the baking process. Looks and sounds awesome! I love browsing the food offerings at Whole Foods for inspiration. Maybe I need to start paying attention to the sweets, too! Love the dark edges to these cookies. Yum! Hi Monica, they have the best display cases and salad bar around. Happy week-end to you! Yes to ALL of these ingredients! I love the idea of these cookies. The more mix ins the better! Thanks Natalie, yes, I agree! Hi GG, that's a great analogy. Happy week-end! 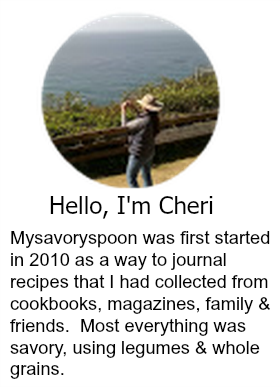 I'm growing to really love all of your recipes, Cheri! These cookies sound amazing. Apart from all the lovely things you've put into them to make them 'everything cookies', I can imagine that the brown sugar, almond flour and oats really makes for a perfect 'cookie base'. Delicious! 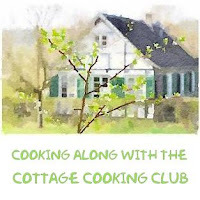 Hi Helen, appreciate your kind words, the almond flour makes the cookies a tad softer than regular flour, love the flavor. I'm all over these! The nutmeg caught my eye, too, that sounds wonderful! Thanks Sue, love fresh grated nutmeg. Happy week-end! Cheri, such a wonderful cookies recipe - I love all the delicious ingredients that you put in the batter - the spices, the oats, the nuts and the chocolate must taste absolutely fabulous all together in this wonderful cookie! What a great recipe to try over the weekend! Thanks Andrea, had a lot of fun baking these too. Happy week-end! Cheri, I think my previous comment disappeared into thin air...these cookies with all those lovely ingredients must taste just fabulous - I love the combination of nuts, spices, dried fruits and oats in these! What a lovely cookie to bake over the weekend! Hi Andrea, received it, not sure what happened. Thanks for the comments. I love it when you get an urge to make something RIGHT NOW and it totally works out. These sound super awesome Cheri! Thanks Karen for the encouragement! Happy week-end! Loaded cookies are the best! You get something different in every bite. I love that you recreated them! Thanks Reeni, it was a fun cookie to make. Happy week-end! Haha, I do the same at Whole Foods. And their muffins? They are HUGE! Anyways, now I'm going to be craving Whole Foods baked goods.. These cookies look divine. I am all for loading cookies with a whole whack load of ingredients! Thanks Cathleen, I know what you mean, I love their salad cases as well.